When does a Property Condition Assessment (PCA) require a deeper look? Terracon’s combination of facilities and geotechnical resources provide our clients the expertise to discover true risks associated with potential properties. A PCA is a facility evaluation that assesses various property elements and provides due diligence information to a lending company to help mitigate their potential risks. Terracon was contacted by a national client to perform PCAs for three buildings in Highlands Ranch, Colorado that the client intended to purchase. The facility was constructed in 2001 and included two multi-story buildings and a single-story structure, predominantly used for office space by multiple tenants. The buildings were steel-framed with load-bearing painted concrete tilt-up walls that were supported by drilled pier concrete foundations built on highly expansive soils. The original soils investigation report indicated that the building foundation was built on expansive soils containing minerals that absorb water, which increases volume of the soil and can stress building foundations, walls, and floors. During the initial project kick-off meeting, our client informed us that the current owner had removed and replaced two 100-foot sections of the concrete floor adjacent to the east and west exterior walls during the spring of 2014, because of settling. The client requested that Terracon provide a recommendation regarding the removal and replacement of the subsided pour-back strip. They also needed to know if the new concrete slab that was recently installed would act in a similar manner as the original concrete by receding over time. 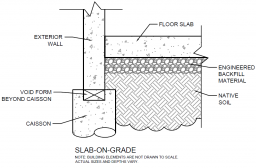 Was the soil inadequately compacted in 2001 prior to slab placement? Were voids created after original construction by water intrusion? Was there leaking underground plumbing in the vicinity that could cause the slab settlement? 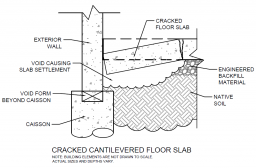 Was the replacement slab installed with recommended engineered soil compaction and structural integrity? During project site observations and interviews with the building contractor regarding construction practices, answers to these questions began to reveal themselves. The original soil beneath the slab in 2001 was not compacted according to the original construction specifications recommended by the structural engineer. 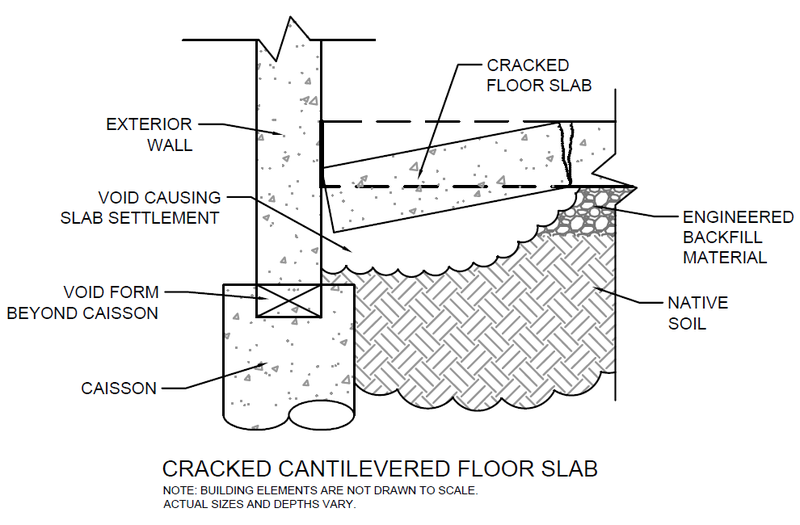 The contractor also indicated that voids in the soil grading were observed adjacent to the exterior wall during interior slab demolition, which forced the slab to perform in a cantilevered fashion, rather than a standard slab-on-grade (see illustrations below). The new concrete slab was also anchored to the exterior concrete tilt-up panel by epoxied rebar, which did not allow for movement of the slab. Because of this, any further movement could damage the existing wall panel. Terracon made several recommendations to the client following the initial evaluation that needed to be completed as part of the due diligence and forensic investigation. These recommendations included a borescope investigation, a desktop review of original soil test results, evaluation of recommended repairs to the new floor slab, and soil test borings to confirm the compaction, moisture, and composition of the soil beneath the slab-on-grade. A borescope investigation completed by the client, inserted a small video camera into the storm drainage system to identify any pipe clogs, breaks, or directional change. The borescope process indicated that all three building roof drain leaders were not compromised, but did show that pipes were installed in a different direction than was suggested by initial as-built drawings. A desktop review of the original soil test results during construction of the building was conducted to confirm that current test results in the field were in-line with the soils report recommended by the original soils engineer. 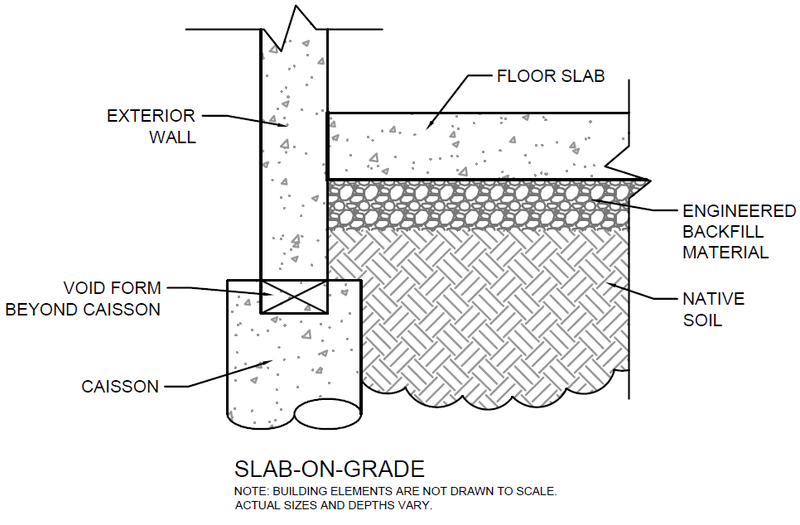 After reviewing the original construction reports and site observation logs, it was determined that the slab and sub-grade were installed according to the original engineered specifications. Terracon also evaluated the recommended repairs of the original geotechnical engineer related to the new floor slab movement. The engineer’s letter indicated that rebar was to be embedded into the existing slab and the perimeter concrete tilt-up walls. It was our opinion that this connection into the perimeter wall would cause additional stress to the exterior walls and the floor slab. Terracon used Ground Penetrating Radar (GPR), a remote sensing technology used to detect anomalies or discontinuities below the ground surface or within structures. This radar technology confirmed the presence of rebar tying the repaired slabs into the exterior concrete walls. Terracon recommended the rebar in the concrete slab be saw-cut to allow independent movement between the slab and the perimeter concrete tilt-up walls. Finally, we conducted test borings through the concrete into the soils below to confirm the compaction, moisture, and composition of the soil beneath the slab-on-grade. Based on the subsurface exploration and laboratory testing results, Terracon found that existing fill below the new slab-on-grade had a relatively low risk of future settlement; however, based on the results of laboratory testing, there would be a relatively moderate to high risk of future slab movement due to expansion of the existing fill. With the combined expertise of Terracon’s Facilities and Geotechnical engineers, our team provided the due diligence necessary for the client to understand the full potential of risks and challenges in maintaining buildings which were constructed on expansive soils.